Dongwon Shin’s ceramic sculptures on the walls emphatically announce, “This is the way to implant my ideas into a space.” Replacing a pencil and a brush drawing with a ceramic assemblage, the-stitched-still-life of ceramic shards respects the style of traditional clay technique that has a 20,000-year history, but at the same time introduces contemporary lines and visual tension in the split of two-dimensionality and three-dimensionality. 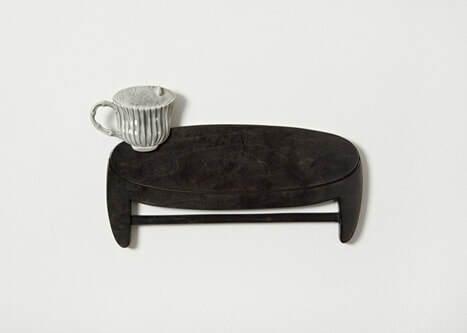 Shin explores the transit of visual invention that runs between still life painting and ceramic sculpture, wood board and clay. Projecting a speculative view of objects and spaces, she reinterprets a commonplace kitchenware and its infinite variables in the context of two different levels of spaces: two-dimensional and three-dimensional space. The first reaction when seeing Shin’s ceramic sculptures is discomfort. 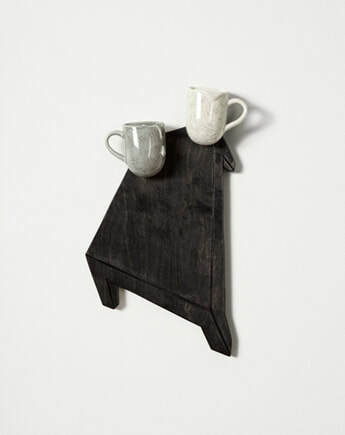 Most of the ceramic cups and vases are precariously slanted and attached on the walls, refusing to be located into a typical three dimensional space. As she has moved to and from different genres, she absorbs the specific conditions of each discipline from materials to language and conceptualizes it into work. The stitched edges of each kitchenware give fabric-like softness to the materiality of typical ceramic works. The monochromatic glazing also lends to the softness.